Would You Like to Reduce YOUR Scoliosis? At Community Chiropractic, we ensure that our patients have a solid understanding of their condition allowing the individual to make an educated choice for their specialized course of care. Gravity is with us every day and it is the main driving force in scoliosis. Gravity pulls on the body and continually worsens the curve during growth spurts and, unfortunately, over a lifetime (especially for curves over 20 degrees). Gravity pulls on the “long side” of the scoliosis which adds strain to the already long ligaments and cartilage. It causes the ligaments and cartilage to get longer and weaker, making the scoliosis curve worse and a more permanent condition. Gravity always wins...unless there is a specific plan in place to neutralize it. Traditionally, scoliosis was treated with compressive casts, bracing or surgery when the curve was greater than 40 degrees or at a high risk of progression. Smaller less severe curves were only monitored and treated when they became more severe. Today there is a more proactive approach than the previous “wait and see” methods. It is important to treat scoliosis curves BEFORE they progress rather than AFTER. Today treatments address scoliosis early on; there are non-invasive treatments that actually reduce the curves. They use scoliosis specific exercises consisting of spinal corrective postures in conjunction with activating the autonomic control of the spines alignment. Patients are treated with a customized neuromuscular re-education exercise program that includes treatment on whole body vibration equipment combined with scoliosis specific exercises. 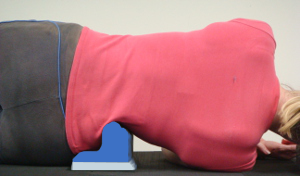 A Scoliroll, spinal orthotic (see pictured below) if incorporated, is placed to support the curve remodeling the ligaments, tendons and re-educating the muscles. Early-intervention is essential to correct and re-establish smaller more stable curves. At times Bracing is recommended. The ScoliBrace is effective in reducing the curves, improving the appearance of the body and in many cases eliminates the need for surgery. ScoliBrace is designed to be almost invisible under clothing. A large variety of designs and modifications are utilized depending on each individuals specific needs. 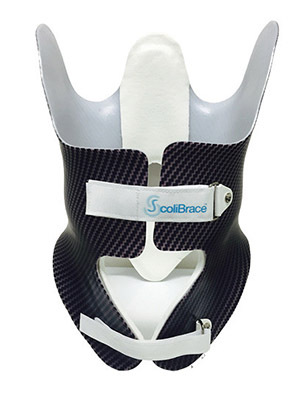 This advanced brace, the Scolibrace released in 2012 is a hypercorrective bracing method. With cases of rapidly progressive curves that are not responsive to an exercise based approach on its own, the ScoliBrace is a powerful tool. Used in conjunction with 3D imaging software, the patient’s X-rays and postural evaluation are factored into designing a brace that is customized to fit their unique needs. By positioning the body and spine in their unique over-corrected or mirror image position, the ScoliBrace can have a super-corrective effect. Curve reductions are achieved in the majority of cases, as well as improvements to the individuals appearance. The brace along with active regular care of the patient provided by a trained clinician are powerful tools for the growing and adapting spine. Braces are modified as the individual grows and the spine changes responding to therapeutic procedures. 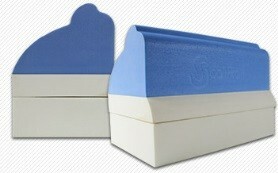 This advanced design can be used in infantile, juvenile, adolescent and adult scoliosis patients. Each design follows the corrective mirror image principle applied to the unique scoliosis presentation of each patient. In 2013, the New England Journal of Medicine published a multi-center study to determine whether wearing scoliosis braces would prevent the need for spinal correction surgery in children with adolescent idiopathic scoliosis. The study was cut short when early results were overwhelmingly in favor of bracing. This study demonstrated when advanced scoliosis bracing is prescribed the need for surgery can be prevented in most cases. The ScoliBrace opens and closes in the front making it easy to wear and remove without assistance. 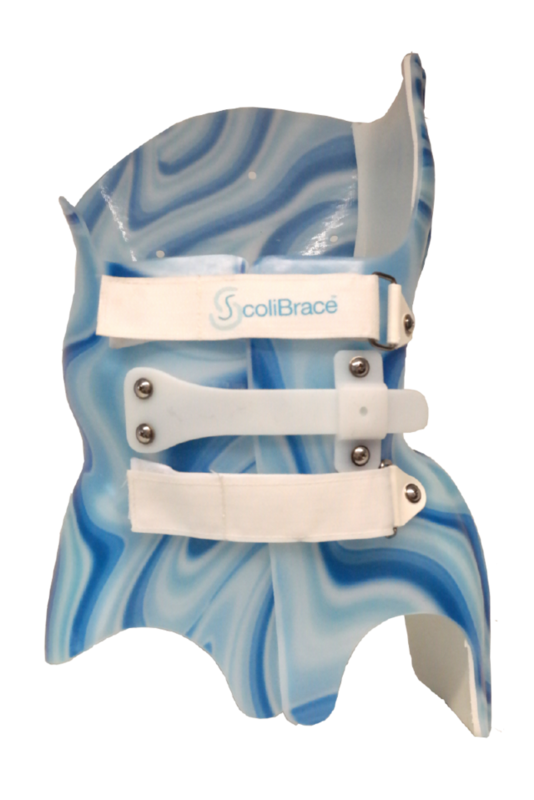 There are a variety of colors and patterns available for patients to personalize the look of their brace. The patient comes in for their initial exam. We assess posture, range of motion, flexibility, foot function, gait, neurological and orthopedic tests are performed. Full spine X-Rays and multiple 3D Scoliscans are taken (Class one laser controlled by depth sensing software make a 3D image.) This 3D body scan is the basis for a completely customized brace design. A follow up visit is scheduled to review exam findings and a program of care is initiated with the doctor if the patient is within traveling distance. When the brace arrives, a fitting session is arranged. At this session the fit is checked and modifications are made to the brace for comfort. Progress reviews and follow-ups are scheduled to ensure the brace and program of care is working effectively. The brace can be modified as the patient grows; the spine straightens or elongates and as the spine responds to the program of care. Myths reflect real concerns, though common bracing problems can be rendered insignificant and irrelevant when a brace is designed and used correctly. What is important to understand while debunking a myth is that nothing assures the cessation of rapid scoliosis progression like a well-designed brace that is used and worn properly. Myth 1: Braces don’t work. Fact : A Brace CAN work, that is, a brace can help a spine grow straighter, stay straighter and strong. Dr. Min H. Mehta, orthopedic surgeon, has some of the best published cases on long term outcomes with bracing. Here is one case that documents dramatic long term improvement in using a brace during growth as a corrective force in the early treatment of progressive infantile scoliosis MH Mehta JBJS 2005. Fact : Rib cage distortion occurs as a result of the scoliosis . Some braces may worsen this distortion, other braces, like the Cheneau-style braces, reduce rib cage distortion. 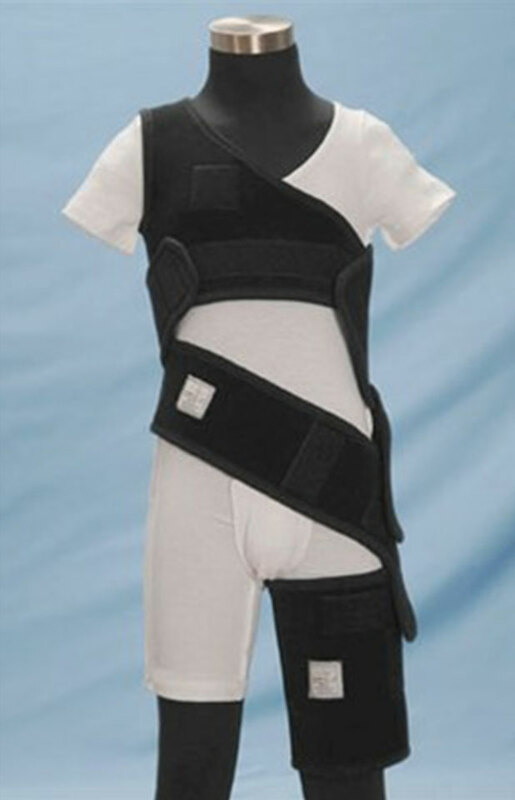 The Boston brace has been the brace of choice for scoliosis in the US. The Boston brace design is suspected of over-compressing the ribs, and doing so in a way that can actually worsen the rotational twist of the spine and rib hump making it more pronounced. Orthopedic surgeons rely heavily on the Boston brace. Most research cited by anti-brace advocates refers to the either Boston brace or designs that are similarly compressive. Myth 3: Braces cause the spine to become stiff, resulting in loss of spinal mobility. As a curve becomes larger in size, the spine loses its ability to move through its normal range of motion. This range of motion loss leads to the stiffness of scoliosis. A brace that is ineffective in straightening the spine, especially if used without an adequate exercise program, can make this stiffness even worse. Myth 4: Wearing a brace will result in weaker spinal muscles. Brace designs vary in how much spinal motion they allow. An extreme example is the soft flexible braces (pictured below left) that allow a full range of motion, but provide less corrective force, where a full-length hard brace (pictured center right) provides maximum compression allowing little spinal motion. In older, outdated bracing, spinal supporting muscles become weak and the curve become worse when the brace was removed. Because ScoliBrace uses a hyper-corrective design with pressure areas along with voids, the muscles stay active and a postural correction occurs while maintaining muscular integrity. The bottom line is: what will actually work most reliably to keep your child’s scoliosis from growing worse. We have seen that a well-designed well-fitting 3-Dimensional brace can be worn for 20+ hours a day and when combined with a good spinal exercise program will result in both a straighter and stronger spine. Myth 5: All scoliosis braces have fundamentally the same problems. Fact: Scoliosis braces vary widely in design as the skill of the specialist fitting the brace to the patient’s body. This myth is often implied, rather than overtly stated, by those who oppose the use of bracing. Some braces are poorly designed and improperly fitted to the patient’s body. Braces may therefore be capable of having all the problems mentioned above, or capable of solving all the problems above. A well-designed 3-D brace that straightens the spine and reduces rib distortion can be a very valuable tool, especially when used in conjunction with exercises and stretches. Scoliosis is an abnormal curve in the spine greater than 10 degrees (see pictured below). 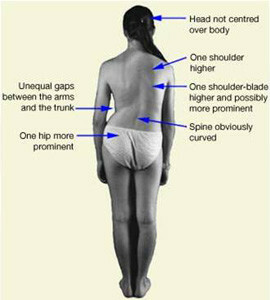 There are several types of scoliosis based on the cause and age at which the curve develops. In most cases, the cause of scoliosis is unknown (idiopathic), but there are some genetics associated with the condition . 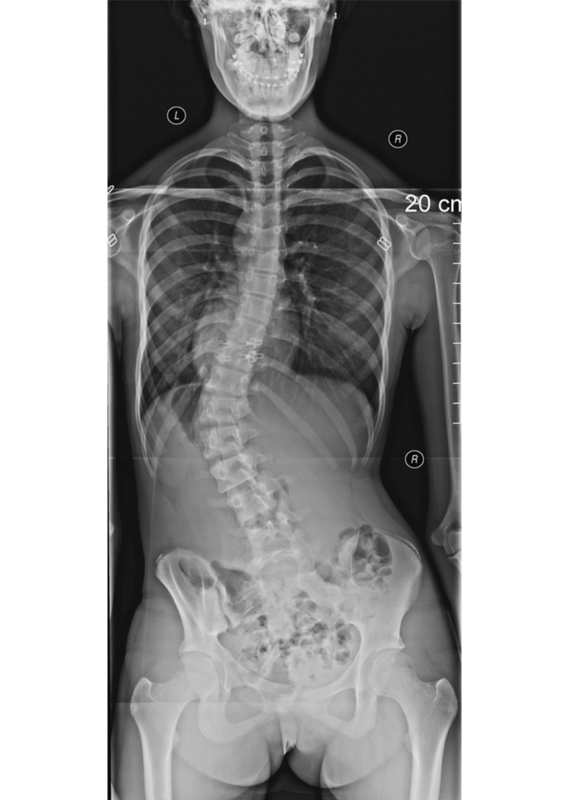 More than 80% of those with scoliosis have idiopathic scoliosis, and the majority of those are adolescent girls. It may start at puberty or during a growth spurt. Scoliosis is about two times more common in girls than boys affecting about 2% of females and 0.5% of males. Scoliosis can be seen at any age, but more common in those over 10 years old. Scoliosis develops in approximately 3% of children younger than 16 years of age. The likelihood of curve progression can be estimated in some cases using the Scoliscore test. Curves will progress an average of .5 degree to 3 degrees per year for life after skeletal maturity, if not being maintained with active care. Curves larger than 50 degrees are high risk and usually, not always, indicate the need for surgery. In 2009 in the United States, there were more than 3600 hospital discharges for spinal surgery to correct adolescent idiopathic scoliosis, the total costs (approximately $514 million) ranked second only to appendicitis among children 10 to 17 years of age. Several harmful myths exist about scoliosis that unfortunately can result in preventable pain and disability for many with scoliosis. Myth #1: There is nothing I can do, short of a major spinal surgery involving rods and fusion of the spinal bones. 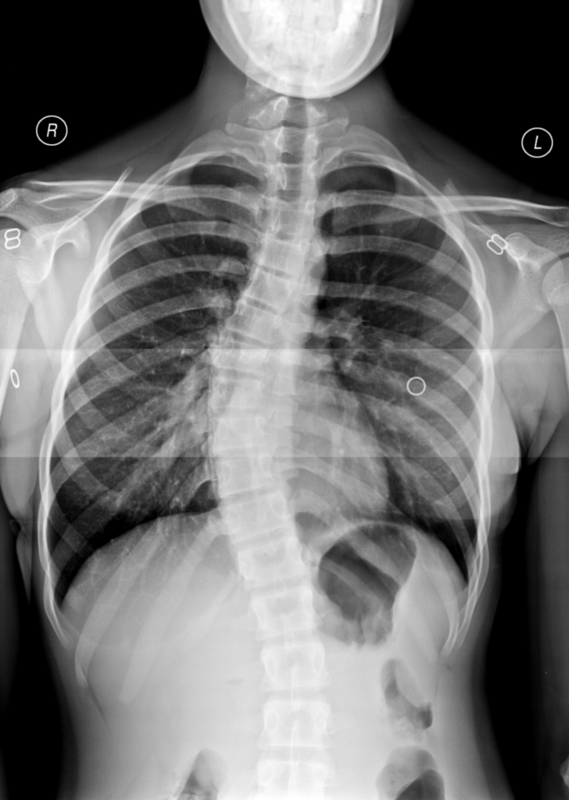 One of the saddest and most destructive myths of all: You can only “watch and wait.” It is common practice for doctors to recommend “observing” mild scoliosis curves, which means once the scoliosis is discovered, it is re-x-rayed until it passes a 30 degree curve at which point it then becomes a candidate for either bracing or surgery. “Waiting” is not a scoliosis treatment, it is just doing nothing and hoping the scoliosis won’t get worse. The longer you wait, the worse the curve gets. Once skeletal maturity is reached, a patient with adolescent idiopathic scoliosis is now said to have Adult Idiopathic Scoliosis. There will typically be a slow increase (about 0.5 degrees to 3 degrees per year) in the curvature that began during teenage years. Where does that put you 10 years from now? 30 years from now? Tragically, much of this pain and deterioration is preventable. Myth #2: Mild scoliosis rarely progress after skeletal maturity. Recent advanced studies have shown this just isn’t true. There are multiple types of scoliosis, some are likely to result in greater, less predictable curves over the course of your life. No matter what kind of scoliosis you have, your curve is most likely to continue to progress through life at a rate of .5 degrees to 3 degrees per year. Many scoliosis patients have heard their condition is not likely to deteriorate as they get older, especially if their curve is mild. Gravity always wins. Even if your scoliosis began during adolescence and you’ve seen little increase of your curve, over time many adult scoliosis sufferers have seen drastic increases in their curve in adulthood. Myth #3: Curves always progress linearly and predictably. Has it been a while since you were first diagnosed with scoliosis? You may be under the impression that your curve will stay the same or progress at the same rate that it always has. This is not always true. While the type of scoliosis you have is a factor, many patients experience more drastic and unpredictable progression of their curves during growth spurts and later in life. Myth #4: If you have no pain from scoliosis now, you never will. Science has shown that a nerve can be compressed by up to 60% before you feel the pain even though the function of the nerve is reduced by the weight of a dime. Pain is very likely to develop later in life even if you had no pain as an adolescent or young adult. In fact, one study indicated that 92% of adult scoliosis sufferers reported pain from their scoliosis. Scoliosis is most often discovered during a routine physical exam. Pain is not typical, but if present may indicate some other condition contributing to the scoliosis, warranting further examination. Once scoliosis is detected, a more extensive physical exam may be conducted along with imaging techniques such as X-rays, CT scans or MRI. A physical examination will indicate that the curve of the spine is more obvious when the individual bends forward (Adam’s Forward Bend Test). 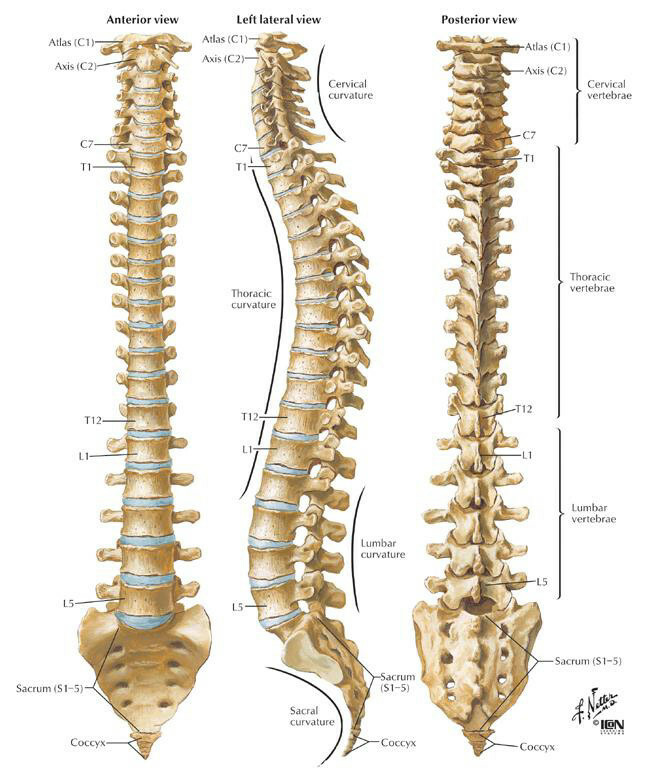 Often the spine curves to the right in the upper back and to the left in the lower back, causing the right shoulder to be higher than the left. One hip may also be more prominent (higher) than the other. 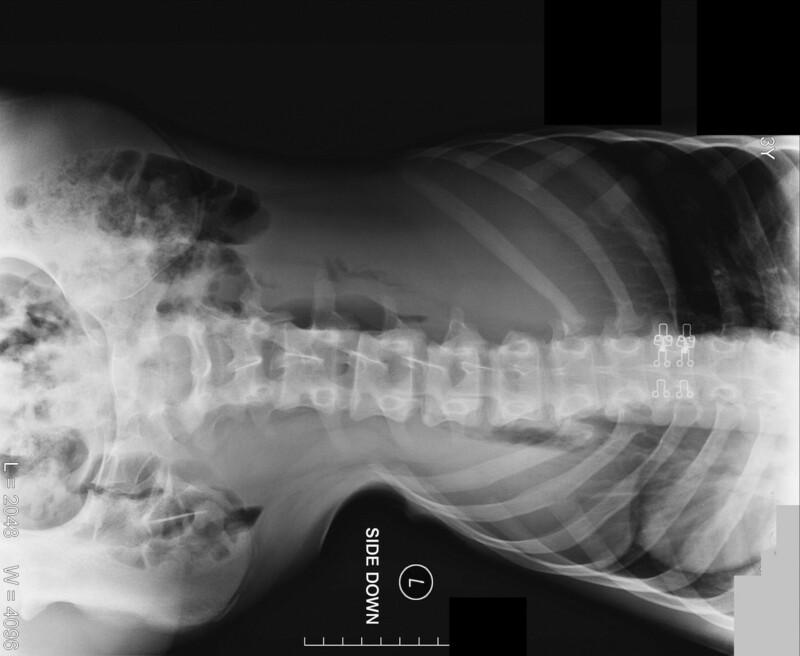 X-rays taken at various angles while the individual is standing will confirm the extent and type of scoliosis. Common alignments in a scoliosis include a bend and twist in the spine. A bend is evident when viewing the spine from the front or back, called the coronal plane. A twist in the spine is when the vertebra is twisted like a rope out of the normal straight-on alignment. The twist and bend almost always occur together in scoliosis. The prognosis for an individual with scoliosis ranges from good to fair, depending on how early the problem is diagnosed and treated. There is no “cure” for scoliosis, but the symptoms and curves may be reduced. Successful treatment relies on early detection of the spinal issue. What Should Your Spine Look Like? the spine should be straight. What are some of the Symptoms of Scoliosis? In this type of scoliosis, either the bones of the spine fail to form completely or they fail to separate from each other during fetal development. This includes muscular dystrophy, cerebral palsy , or Marfan Syndrome (an inherited connective tissue disease). People with these conditions often develop a long C-shaped curve and have weak muscles that are unable to hold them up straight. If the curve is present at birth, it is called congenital. This type of scoliosis is often much more severe and needs more aggressive treatment than other forms of scoliosis. With this scoliosis, a curve develops because of a problem somewhere else in the body. For example, this might be caused by one leg being shorter than the other. Other potential causes include spinal tumors such as Osteoid Osteoma. This is a benign tumor that can occur in the spine and cause pain , This causes individuals to lean the opposite direction to reduce the amount of pressure applied to the tumor. Infants less than 3 years old who have scoliosis are classified with infantile scoliosis. In the past, a series of rigid plaster casts were created to correct infantile scoliosis. The child would be casted every 6 months or so as they grew. 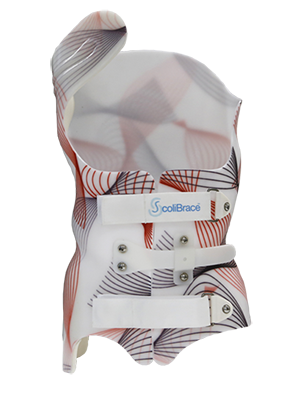 A ScoliBrace™, a fully padded over-corrective hard plastic brace, has been developed specifically for infants. 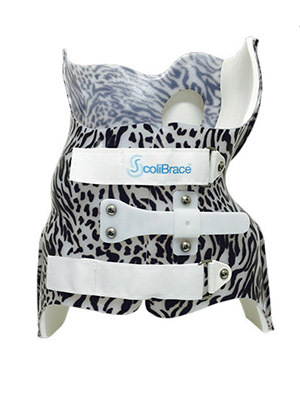 The infantile ScoliBrace™ can be removed to allow the child out of the brace during washing and playtime. Juvenile scoliosis (3-9 years old) can have progressive curves. In most juvenile cases the ScoliBrace can reduce the curve. 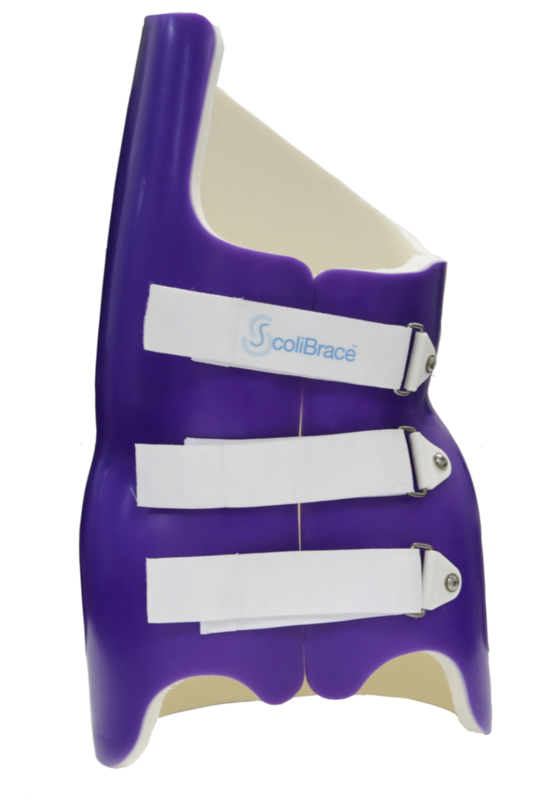 After the first 6 months of treatment, juvenile patients can often continue to wear the ScoliBrace part-time or at night until they reach their adolescent growth spurt. Depending on the maturity level Scoliosis specific exercises and a Scoliroll may be incorporated. Adolescent Idiopathic Scoliosis (AIS) is sometimes referred to as “teenage scoliosis” and is characterized by a lateral curvature of the spine with a Cobb angle of more than 10 degrees with vertebral rotation. It is found in 2 to 4 percent of children between 10 and 16 years of age. With AIS, the curve can progress rapidly during a growth spurt upwards of 40 degrees. This is concerning for parents and adolescent. 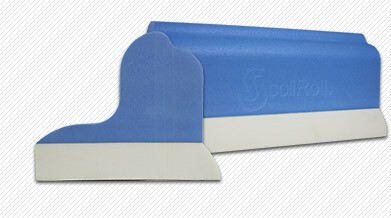 The ScoliBrace is designed to be applied while the spine is still growing during adolescence (10-18 years old). ScoliBrace moves the patient into a super-corrected position to retrain the curve as the child grows. If applied before or during the growth period, a good correction can be made and maintained. The adolescent is ALWAYS provided with a custom designed home exercise program and depending on the curve severity and situation Scolirolls will be utilized. Adult Scoliosis or De-Novo (Adult Degenerative) is currently the largest growing population of scoliosis. It can originate from changes in the spine due to arthritis known as spondylosis or from a pre-existing adolescent scoliosis because the curve has increased .5 degrees to 3 degrees per year. It is caused by weakening of the ligaments and other soft tissues of the spine combined with bone spurs which can lead to an abnormal curvature of the spine. The spine can also be affected by osteoporosis , vertebral compression fractures and disc degeneration. After the spine reaches skeletal maturity, a different bracing strategy can be used to stabilize the curve and reduce or eliminate pain and improve posture and appearance. Depending on the type of scoliosis, ScoliBrace™ can be used to help pain, hold the curve or improve the appearance of the body. A low profile ScoliBrace™ that targets the lumbar spine can be used to make the adult ScoliBrace nearly invisible under clothing. Adult scoliosis patients may only have to wear the brace for 4-8 hours per day to get significant pain relief and postural correction when used with a custom designed home exercise program. Can Custom Foot Orthotics Reverse Scoliosis? Orthotics, foot orthoses, orthotic devices or biomechanical orthotic devices change the pressure on the weight-bearing surface of the foot altering motion. They allow for normal motion and limit abnormal motion. They can correct problems such as: excessive pronation, low arches, high arches and painful feet. They are also prescribed following some foot surgeries to help maintain the correction achieved with surgery. By altering the heel height, custom orthotics can also be used to correct or reduce a short leg or what is known as a leg length inequality. This may be a contributing factor in a scoliosis. Start right now to improve your quality of life and have a brighter future! Call me, Dr. Larry at 570-992-1011 and get checked!